The association's Safety and Health Committee focuses on educating members and keeping them up-to-date on safety regulations. Additionally, Toolbox Safety Talks are published each week as part of the Newsletter. The National Resource Center, an OSHA Education Center in Region III, is dedicated to offering high quality services for client training needs. OSHA Region III includes the District of Columbia, Delaware, Maryland, Pennsylvania, Virginia and West Virginia. The NRC is comprised of three organizations, including the Safety and Health Extension at WVU. CAWV members, through the AGC of America, are provided with a 10% discount on all courses available through ClickSafety. ClickSafety offers a hundreds of OSHA-approved web-based programs in construction, general industry, environmental, safety and health, management, awareness, DOT, employee orientation and human resources. For full information, click here to view the CAWV-ClickSafety page. CAWV members have full access to AGC's Safety and Health Services which provide a wealth of information and services on construction safety and health through numerous safety resources. 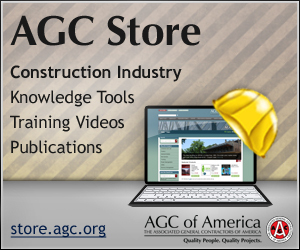 Visit the AGC Store to take advantage of their extensive safety and health library. They also offer a robust safety program (available here) which includes advocacy with federal agencies and Congress, numerous partnerships, coalitions and valuable resources.